Love sayings are perfect for Valentine's cards. My little one had a great time making her cards this year and all the grandparents love getting her cards. Handmade cards are more sentimental than purchased ones because you took extra time to make them. 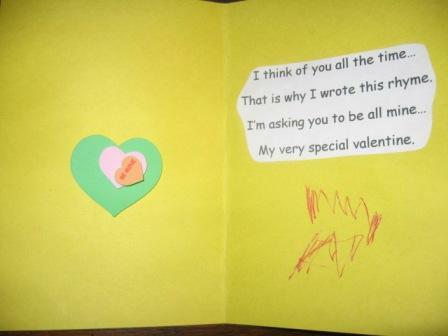 If you have the time this year consider gathering a few items and make your own Valentines. I like to include a small poem or message in our cards. These poems do not have to be elaborate and they don't have to rhyme. You can use these Valentine poems as written or use them as inspiration to write your own message. Depending on the age and ability of your preschooler they can help write their own message. Please say you'll be mine. Enjoying Fun Preschool Activities...Consider subscribing to our E-Zine. Receive subscriber only information and ideas along with updates to our website right in your in box. Don't miss another issue. Subscribe Now.